Quick Post: This pesto has rich flavor and was perfect mixed in to goat cheese for stuffed chicken breasts. I plan on using this again in some pasta and probably tossed with some kind of mild white fish. 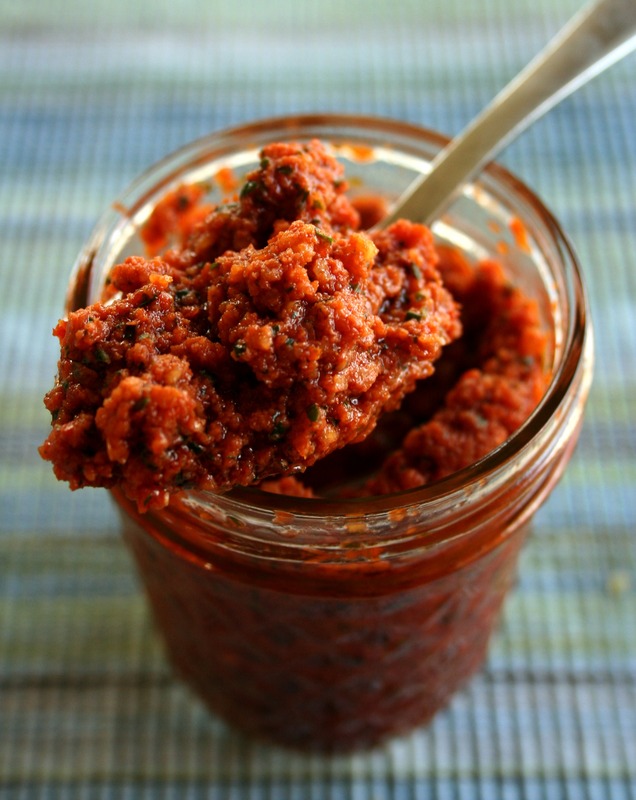 I bet it would taste amazing spread onto a grilled chicken sandwich – I’ll have to try that too 🙂 I had just enough sun dried tomatoes left for this and the food processor makes this a breeze to whip up. Also, the recipe makes about two cups and keeps well in the fridge for up to six weeks according to the author. Thanks for reading, enjoy! An hour before you make this, soak your sun dried tomatoes in hot water for at least an hour. Drain and slice, set aside. Toast your almonds in a dry shallow pan. They will take about 10 minutes, and you will smell when they are done. In a large food processor, combine the basil, toasted almonds, garlic, lemon zest, and salt. Process until coarsely chopped. Add the sun dried tomatoes and parmesan cheese and process until the tomatoes are coarsely chopped. Now stream in the olive oil slowly and process until the pesto comes together. Serve immediately or store in an air tight container in the fridge for up to 6 weeks.